The Old Stone Church was used from 1867-1879. It was located at 228 Main Street in Cañon City, CO. This drawing is by Betty Doane. 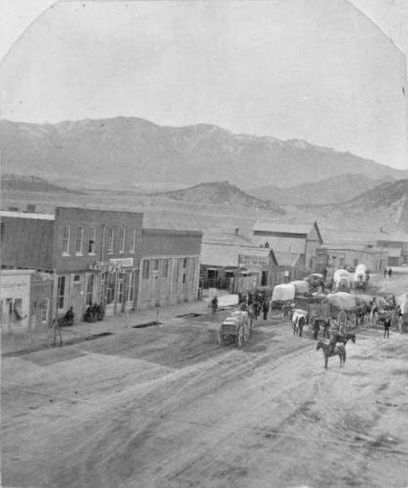 1870-Main Street between Second and Third Street on the south side. 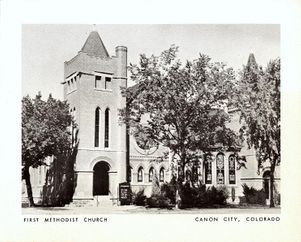 The one story building in the center of the picture, just to the right of the two story building, was the first building owned by the Methodists in Cañon City, Colorado. This building was purchased in 1866. It was used as the Methodist church from 1867 until 1879. In 1979 it was used as Macs Auto Supply. 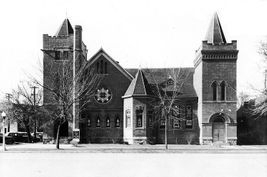 In 1878 the store building was sold and a neat brick church, the "Gothic Church", was erected on the northeast corner of Fifth and Main, Cañon City, Colorado. The Cañon City First Methodist Church is on the left next to the Public Library. This picture is by pioneer photographer Charles E. Emery and was taken about 1887. Notice the wooden plank sidewalks. 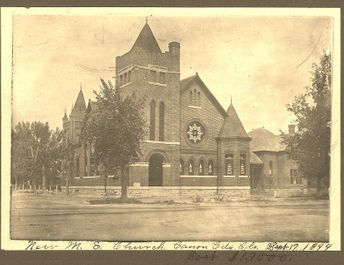 1906 postcard featuring the Church. Rev. and Mrs. James F. Harris photographed in the sanctuary of the Old Gothic Church located at 5th and Main Street in Cañon City. Photographed by Fricke & Co.
Rev. Harris served three pastorates: 1891-1892, 1894-1896, and 1910-1913. During his first year at Cañon City, he held what Beardsley (see reference at bottom of page) calls "a gracious revival." 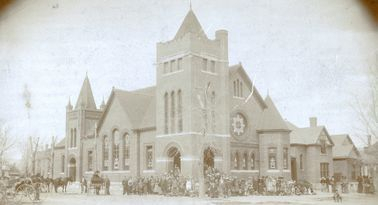 The revival, which lasted six weeks, resulted in over 100 conversions and the addition of many members to the congregation. New M. E. Church, built 1899, cost $13,000. It was a proud day for the members of the Methodist Episcopal Church of the area when they gathered outside their new building at Eighth and Main in 1899 for this group picture. In this picture, the parsonage stands next door to the east. This was moved in 1904 to 1008 Greenwood, where it served from many years as the parsonage. 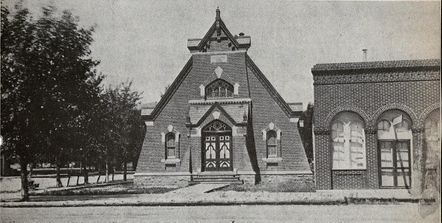 At that time, an addition was built to the existing church. 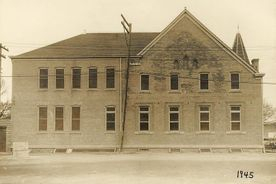 In 1946, further expansion was needed, and the congregation spent $35,000 to enlarge and remodel the basement for a new kitchen and dining room, now known as Fellowship Hall. 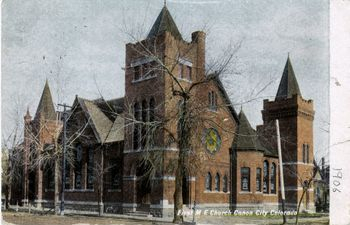 1945 views of the church from Main Street, the west side and the north side. 1960 Greeting Card featuring the church. 1968 photo at Eighth and Main Streets. 1977 photo from the west side. 1987 photo of the entrance to the Sanctuary.